Daniela Popa’s husband was away on spiritual retreat in Mount Athos, Greece, when she suddenly began to experience a high fever that she could not bring under control. It was May 2005. Daniela’s worries increased when she also began to experience heavy fatigue, intense sweating, and swollen neck glands. When Daniela’s husband Richard finally returned, an emergency biopsy revealed stage 2 Hodgkin lymphoma, or cancer of the lymphatic system. Natural treatment proved ineffective and within months, Daniela was fighting for her life against the most aggressive form of the cancer (stage 4). 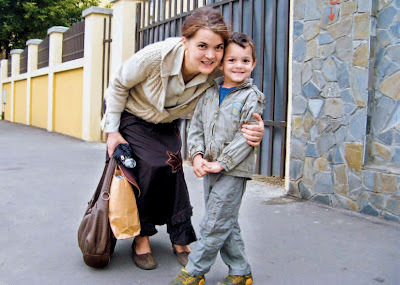 “The fever was higher, my glands had grown bigger and I was itching all over my body,” recalled Daniela in an interview with Familia Ortodoxă magazine. By September, Daniela was hardly able to walk anymore. Her swollen glands made her neck double in size. The pain and the abundant sweating made it practically impossible for her to sleep at night. “I would change my clothes a dozen times a night, and my fever would not go below 38 °C (100.4 °F),” she recounted. Daniela began a desperate regimen of chemotherapy which was to be followed by radiotherapy, but had to stop after her body refused to cooperate with the grueling treatment. Subsequent tests revealed why. Daniela had contracted tuberculosis. The body of the sick woman was now saturated with a matrix of chemotherapy drugs and nine antibiotics that she had taken for six weeks to combat tuberculosis. A tomography was scheduled to determine how much damage the tuberculosis had caused to Daniela’s lungs. Daniela was about to receive the most challenging news of her life. What Daniela did not know was that the doctor had stopped the machine when he noticed that his patient was not the only one being scanned. Daniela was pregnant. The doctor restarted the scan only after consulting with Daniela’s husband Richard. “Basically, I was irradiated twice,” said Daniela. The newly discovered life in Daniela’s womb now had three strikes against it. Not only did the little one have to contend with the toxic environment of chemotherapy drugs and tuberculosis antibiotics, but it also had just received a double-dose of radiation, which is known to cause severe health defects to unborn babies. Doctors strongly urged the parents to terminate. 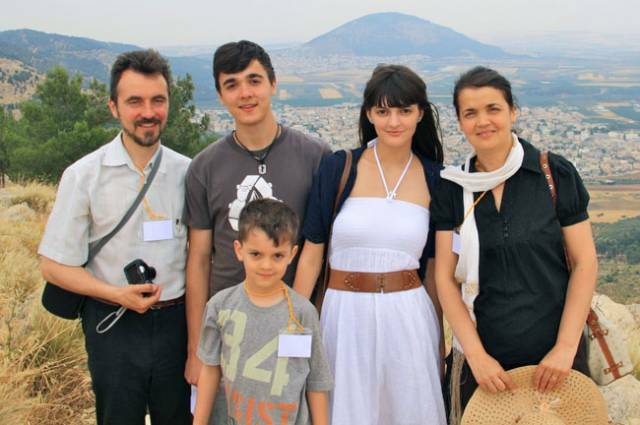 Daniela and Richard approached their ‘spiritual father’, Orthodox priest Ion Popescu, and asked if they should follow the advice of the doctors. “You have no right whatsoever over the life of that child,” the priest responded gently. With new hearts, the couple now turned to their faith as a previously untapped source of courage, hope, and strength. Up until now they had placed their trust in doctors and drugs to overcome the sickness. Now, with a baby in the picture, and with the blessing of their spiritual father, they decided to place all their trust in God. Stepping out in faith, Daniela decided to interrupt all treatments and give no more thoughts to her sickness. She focused exclusively on the life of the child in her womb. The couple begged for prayers from the faith-filled people who lived in their area. Their plight inspired an entire monastery [Putna Monastery], where Daniela’s brother is a monk, to storm heaven with prayers for the protection of the mother and child and for a safe delivery. Daniela turned to the ‘Holy Mysteries” of her faith for strength and healing. Every week she received the Anointing of the Sick. She frequented the sacrament of Confession to make her soul right with God. She made every effort to regularly receive Jesus into her ailing body in Holy Communion. One gynecologist, however, continued to insist that Daniela abort, pointing out that “you can’t have it all: get healed, see your child live, and also see it free of malformation”. But that doctor was wrong. On January 17 2007, the feast day of Saint Anthony the Great, little Antonie came into the world. To the astonishment of all the doctors, numerous tests revealed that the child was perfectly healthy. “We regard this miracle as the fruit of the prayers of many of our brethren – monks, priests, and laymen,” the parents say. The doctors were even more astonished by the improved condition of Daniela’s health. An X-ray after the baby’s birth showed a complete absence of tuberculosis. Further tests indicated that even Daniela’s cancer was in remission. Daniela, who is now cancer free and enjoys good health, believes that she went through this time of trial so that “God’s power would be shown”. “Through the miracle that we lived, God’s power was shown”. The couple has learned to “thank God for this trial”, saying that it has set a “fire in our hearts for God”. They will be forever grateful for the words of their ‘spiritual father’, words that they say were the “beginning of a miracle”. Editor’s note: Richard told LifeSiteNews that Antonie, now 6, is a “clever, beautiful, obedient boy” with “a lot of energy” who is “loved by all”. Daniela continues to enjoy good health and the blessing of being surrounded by her loving family including Mihaela, 17, and Andrei, 16. For an interview with Daniela Popa, read here.